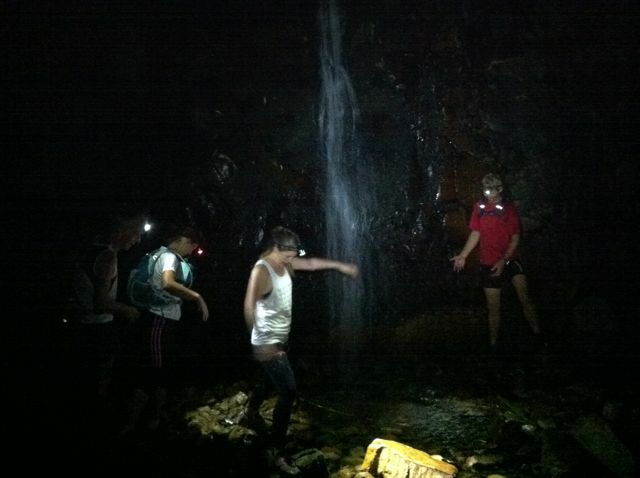 At the start of the week, online chatter began about a group of friends planning their next night trail run. They’ve done a few in the last month or two, but this time I was excited, because for the first time I wasn’t at work. TC of Trail Running E-News fame picked me up in his car. At the time, I thought he was the president of the local running club, so was able to tell my girlfriend, “I have the president on the line!” This turned out to be untrue – it was another Terry – but it sounded good at the time. TC valiantly negotiated the least straight road in South Australia to the top of Mount Lofty, where we met the others. Six of us launched into the darkness down a narrow trail, our head torches illuminating the eucalypts that leaned in on both sides. In the lead was a 69-year-old ultra-runner, WD, who is still regularly running 60-100km races in times that most younger runners cannot achieve. This is confirmation of a recent study that found that muscle mass in older athletes does not inevitably decrease with age, as previously thought, but remains if the muscles are regularly exercised. If I am as fit as that when I reach sixty, I will be a happy man! WD knows the trails well and had planned a hilly 14km circuit for us. 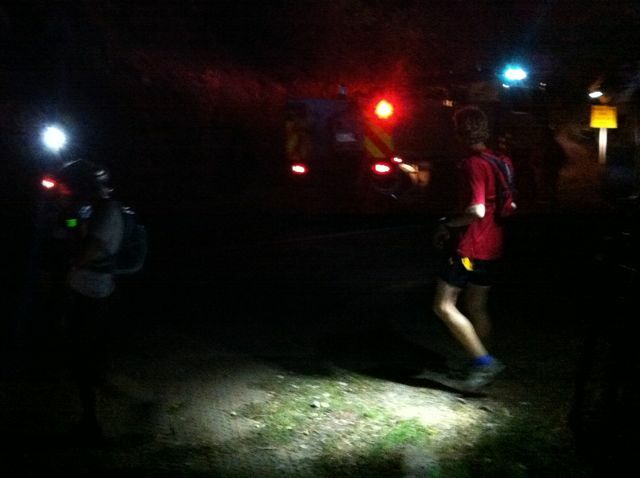 Running down the Long Ridge Track, we came upon two Country Fire Service trucks and their crews, who had mopped up a small fire. I think it may have sprung up again from a prescribed burn. One of the CFS guys said wistfully that this was the last time he would go hiking on his afternoon off. He had seen flames next to the trail and called it in. Soon afterwards, his afternoon off was a distant memory and he was suited up with his colleagues fighting the blaze himself. We ran up Waterfall Gully Road, where WD pointed out the old Coach House and stables. At the closed-up café, a friend pointed out several orb spiders, which were “hanging out” by the outdoor chairs. He assured me they could bite but weren’t poisonous. They started to crawl back up their bungee cords to escape from our lights. The Waterfall Gully track itself was uncharacteristically quiet – in daylight hours it usually has enough traffic to make it the trail equivalent of the three-lane highway into Adelaide. 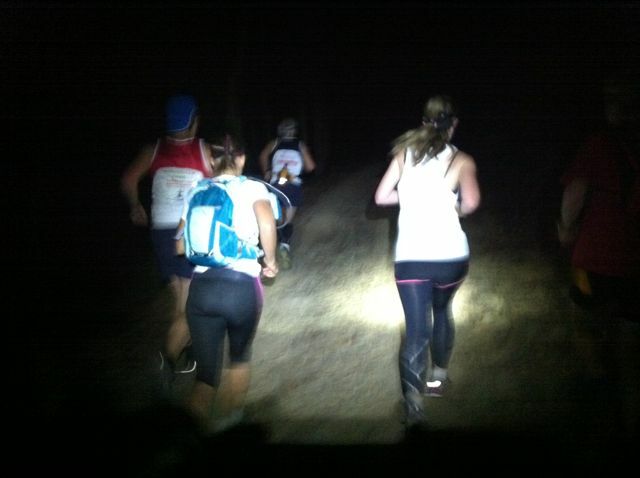 We did pass one lone runner enjoying the solitude and darkness. At Second Falls we stopped to enjoy the waterfall, then it was onward and upward onto Chinaman’s Hut Track, which led all the way back up to Mount Lofty summit.